When Prince William and Kate Middleton made their first official press appearance as an engaged couple on November 17, 2010, the bride-to-be was wearing a sparkling sapphire ring surrounded with diamonds - the same ring that Prince Charles once gave Diana Spencer during their engagement. The groom to-be, also known as "Will," carried this reminder of his mother, who died in a car accident in 1997, throughout the couple's vacation spent in Kenya, waiting for the right time to pop the question. defining image of their wedding day. 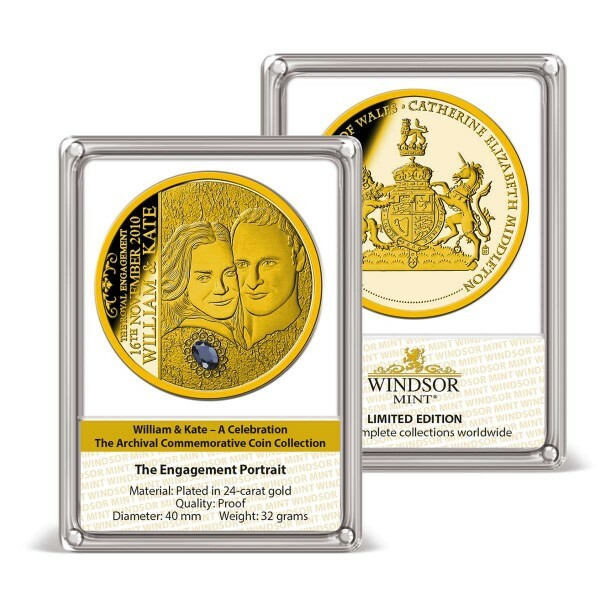 Featuring an expertly engraved official engagement portrait of the happy couple, The Royal Engagement Ring that William presented to Kate, is represented by an actual gemstone that has been hand-set onto this commemorative strike.